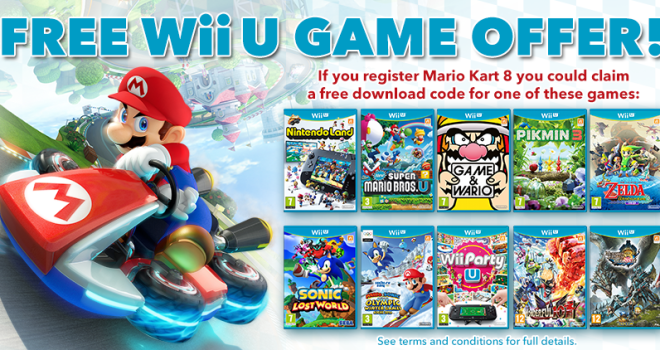 This is great news for Nintendo fans, Nintendo is offering one free game to anyone who buys Mario Kart 8. North America Gamers will get to choose from one out of four games. New Super Mario Bros. U, Pikmin 3, The Legend of Zelda: The Wind Waker HD, and Wii Party U.While Europe gets to choose from one out of ten games. Nintendo Land ,New Super Mario Bros U, Monster Hunter 3 Ultimate, Game & Wario, Pikman 3, The Wonderful 101, Sonic Lost World, Mario & Sonic at the Sochi 2014 Olympic Games, Wii Party U. There is something that you will have to do in order to qualify for this offer. You will have to register your copy of Mario Kart 8 on Club Nintendo before July 31 in order to be eligible for the free Wii U game. Also if you buy the Mario Kart 8 Wii U Bundle or purchase the game on the Wii U e shop you will still be qualify for the promotion.